If your dream bathroom evokes feelings of tranquility, soaking in a Jacuzzi bathtub, draping yourself in plush robe and lounging in an open space, you’re not alone. If your reality involves a pedestal sink, zero storage space, and an inward swinging door, you are also not alone. But not to worry, you can still achieve that spa-like feeling of serenity in your closet-sized bathroom. 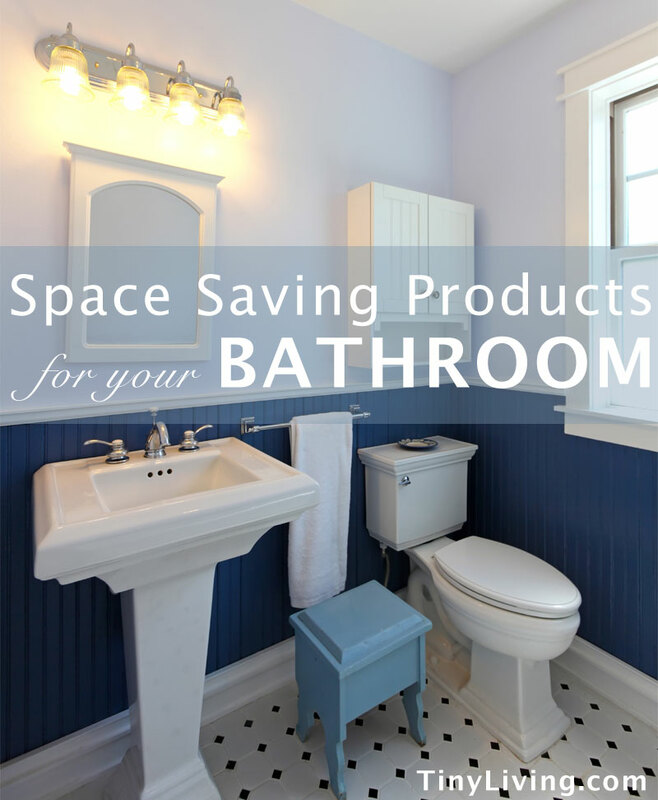 Space is often the trickiest component in creating a clutter-free peaceful bathroom. But with the right products for proper storage and organization, that small space can be transformed into your very own personal Zen zone. One of the best ways to save space is with a shower caddy. Many showers have the space, but lack the storage for your everyday products. A great starter caddy, perfect for dorm rooms or first time renters, is the Zenna Home Premium Rust-Resistant Showerhead Caddy ($9.74). It is lightweight and durable, with built in shelves and hooks. If you are looking for a longer-lasting more versatile shower caddy, the OXO Good Grips Stainless Steel 3 Tier Shower Caddy ($29.99) is the way to go. Since it’s made with stainless steel, it won’t rust, plus its durability and sleek lines give it a stylish presence in your shower. The hook will securely grip the standard showerhead, preventing continual slippage, and the removable trays make it easy to clean. It even has bottle holes in the shelving for storing products upside down. Any dweller knows that a pedestal sink is chic, but the downside is the lack of storage. In order to keep that clean, sleek bathroom look without sacrificing style, try installing shelving. Whether you hang a shelving unit behind the door or mount one to the wall, it’s a great way to store bathroom necessities in a small space. By installing behind the door shelving, clutter is out of immediate view and the shelves are often customizable. The Container Store is known for its elfa shelving, which provides organizational solutions for every part of your home. The elfa Utility Bathroom Door and Wall Rack Solution ($107.92) is a vertical space saver that is designed to hang behind the standard bathroom door. It is customizable with easy to remove baskets fit for storing lotions, makeup, and extra toilet paper. It comes with one large deep basket, three medium shallow baskets, and two small baskets that can be installed in any order. The alternative to shelving behind the door is to mount shelves on the wall, such as above the toilet. This is a more stylish approach to saving space with a variety of shelving materials to choose from, like steel and wood. The Organize It All Metro 2-Tier Wall Mounting Rack with Towel Bars ($22.99) is the perfect two-in one space saver. This standard shelf has a chrome finish and is perfect for storing folded towels and decorative containers for cotton balls and q-tips. It also has two towel bars, perfect for hanging hand towels or wash clothes. While shelving can be the best solution when it comes to storing and organizing bathroom products that are relatively the same shape, it’s those oddly sized essentials that are left without a home. There is nothing Zen about a tangled blow dryer cord or finding a safe spot to store that hot curling iron. The Spectrum Grid Over The Cabinet Door Styling Center ($19.98) is an easy to install space saver that hangs over your cabinet door. It is made of heat resistant steel to allow hot items to cool safely and has different sized holes to accommodate a hairdryer, a curling iron, hairbrushes and other accessories. This is the perfect solution if you have a cabinet under your sink. If you don’t already have a mirror above your sink, consider installing a surface mount mirrored medicine cabinet. This will provide the added benefit of storing small bathroom essentials, such as toothpaste and a toothbrush, without cluttering surfaces like your sink. The Elegant Home Fashions Madison Avenue Medicine Cabinet ($65 – 79) from Bellacor is stylish and versatile. The cherry wood finish will match a variety of bathroom decors and the hinged door with silver clasp is a simple feature that will keep personal items out of view. For a more modern look and a slightly larger wall space, the LILLANGEN Mirror Cabinet ($70) from Ikea is a great addition for those looking to spend a little less. The double doors allow for more interior space and the shelves inside are adjustable for products ranging in size. The LILLANGEN cabinet is also available in different variations, such as a center mirror with open shelving units on either side. You can customize the structure that best fits your bathroom needs and aesthetic. Once you have added these helpful space savers and made your bathroom clutter-free, don’t forget to light a candle or two, throw on that plush robe and relax.